Details: Malcolm reported seeing a Hyundai i800 minibus with Stagecoach London in early 2018, following use of a demonstrator towards the end of 2017. Ray duly dispatched himself to track it down and, though it took two trips, he did eventually photograph it at the Tescos in Rainham. 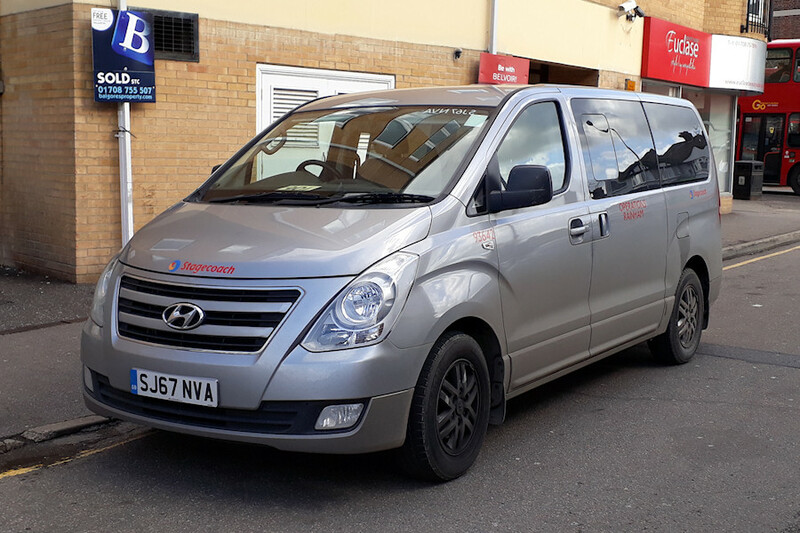 This however is a photo taken later by Malcolm, showing the minibus resting in Romford on 16th March 2018. As can be seen, it has red lettering on its silver bodywork, including 'Operations, Rainham' and a national fleetnumber of 93642. The registration number is repeated inside the windscreen. A second vehicle of this type is believed to also be working from Rainham but full details are not yet to hand.